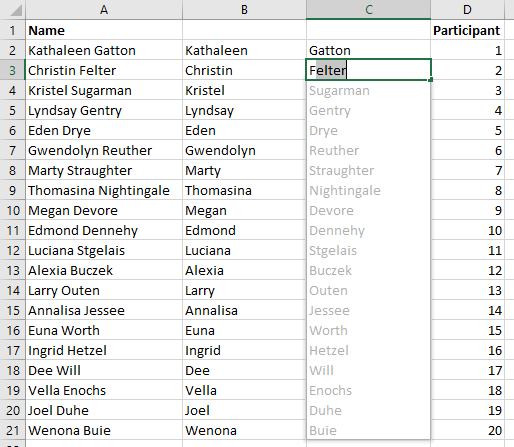 Flash Fill allows you to quickly break up a column of data into parts, for example, extract out the last name from a column of names and display it in the adjacent column. After typing a cell or two, flash fill extracts just the data you need from the other cells in the column. This article shows Excel 2016, but this process also works in Excel 2013. Note: Flash fill works when typing data from existing cells. 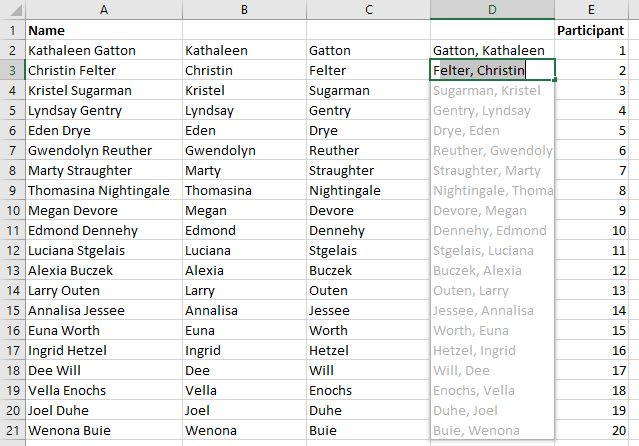 This example shows an existing list of full names, using flash fill to separate first and last names, and format them a certain way. Insert a blank column, if there isn't already one, to the right of the column containing the data you wish to split or format. 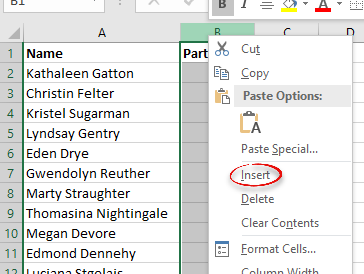 To do this, right-click the letter above the column to the right of the one containing the data (Excel inserts a blank column to the left of the one that is selected). On the resulting menu, select Insert. A blank column will be inserted to the left of the selected column and to the right of the column containing the data to split/format. In the blank column, begin typing the information from the original column that you would like to split or format. 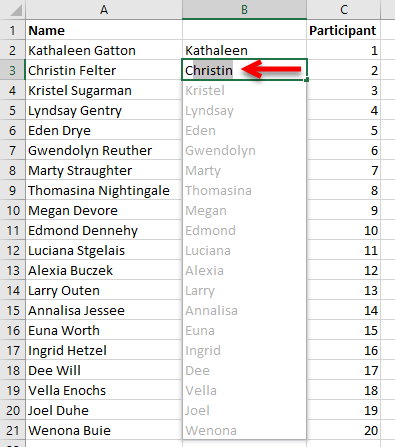 In this example, which is separating first and last names, the first names from the original column are entered into the blank column. You will only need to do this for a cell or two. After you have entered a few cells of data, you will see the flash fill feature appear. Press the [Enter] key to apply flash fill to the remaining cells. Repeat Steps 3 and 4 to split other information from the original column, in this case the last names. Note that flash fill is case sensitive, meaning the same formatting will be applied to all of the data. Step 6:Flash fill will also format information from the original column. In this example, the names are formatted by last, first. Another example of formatting information uses numbers. In this case, the social security numbers are formatted with dashes using flash fill.